These are the projects in which our group has worked during the years. We have collabored with several companies as well as universities, obtaining funds from local, national and international entities. Click on each one to know more. Control Strategies for Isolable NanoGrids. Involvement: Coordinates project with UCo and UCa. Financed by: Ministerio de Economía inside the Programa estatal de I+D+i orientada a retos. Energy management system for an smart community: micro-hybrid storage system, SCEMS-mHESS (TEC2013-47316-C3-3-P). 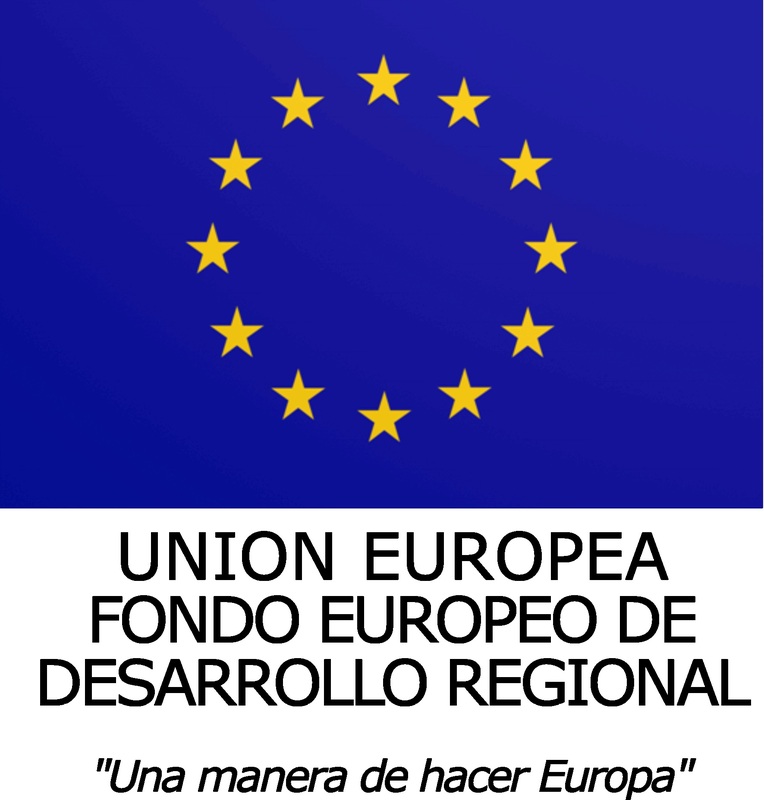 Involvement: Coordinated project between Extremadura, Cádiz and Córdoba Universities. Financed by: Ministerio de Economia Y Competitividad inside the Plan Nacional de Investigacion. Hybrid Energy Storage System for manageable photovoltaic generation facilities. Involvement: Carrying out research group. Financed by: Gobierno de Extremadura, Secretaria de Ciencia y Tecnologia inside the IV PRI . Performance evaluation and diagnosis of photovoltaic plants. Involvement: Carrying out researching group. Financed by: Junta de Extremadura (Fondos FEDER) inside the (IV Plan Regional de I+D+i) Proyectos de Cooperación Sectores Estratégicos. Summary: The main goal of this proyect is the technical evaluation of inverters used in photovoltaic plants to inject the power into the electrical grid. Its behaviour and working is analyzed through the study of waveform quality at the PCC, device connections, protections, output filters and efficiency. Different studies are carried out in different real photovoltaic systems which owners are involved in the project. The study is adds simulation studies and laboratory tests to detect problems, doing proposals and solutions of the detected problems that could be appear. National Instrument hardware and software platform evaluation for designing and prototyping of motor drive algorithms and comparison with others tecnologies available on the market. Financed by: National Instruments Spain (Texas Corporation). Summary: In this project a permanent magnet Synchronous Motor (PMSM) is controlled by a Field Oriented Control (FOC) algorithm developed in MATLAB/Simulink and implemented in a rapid prototyping control platform based on National Instruments (NI). The rapid prototyping software interface is done with NI Veristand while the hardware consists of a NI PXI chassis equipped with a controller to run the algorithm, a FPGA to implement time critical parts, and CAN connectivity for end user interface communication. The goal of the project is to compare this rapid prototyping NI PXI platform with the rapid prototyping dSPACE AutoBox platform using the same FOC MATLAB/Simulink algorithm. PROINVER: Conversion and protection solutions in power electrical system scenarios with high penetration level of distributed energy resources. Summary: The main goal of this project is to develop new technological solutions and new protection systems in the power electrical grids with high power level of distributed energy resources, in order to assure the elecrical power supply quality and the security and reliability of the future electrical grids. PE&ES research group have carried out several simulation studies to test and to analyze different anti-islanding control algorithms in multi-inverter environment. Ten organizations are involved in this project. Spanish and cuban cooperation program to tranfer and exchange knowledges about distributed generation with photovoltaic solar energy. Financed by: Agencia Española de Cooperación Internacional para el Desarrollo (AECID). Summary: Different meeting and technical presentations have done between both groups in the Solar Energy Research Center (CIES) in Santiago de Cuba and in the Research and Electrical Energy Test Lab Center(CIPEL) in la Habana. Several works in Cuban photovoltaic plants have been carried out by PE&ES research group such us: measurements and power quality analysis providing different advices and technical training about maintenance and built photovoltaic plants. University of Oriente did a research stage in the University of Extremadura during September of 2012. 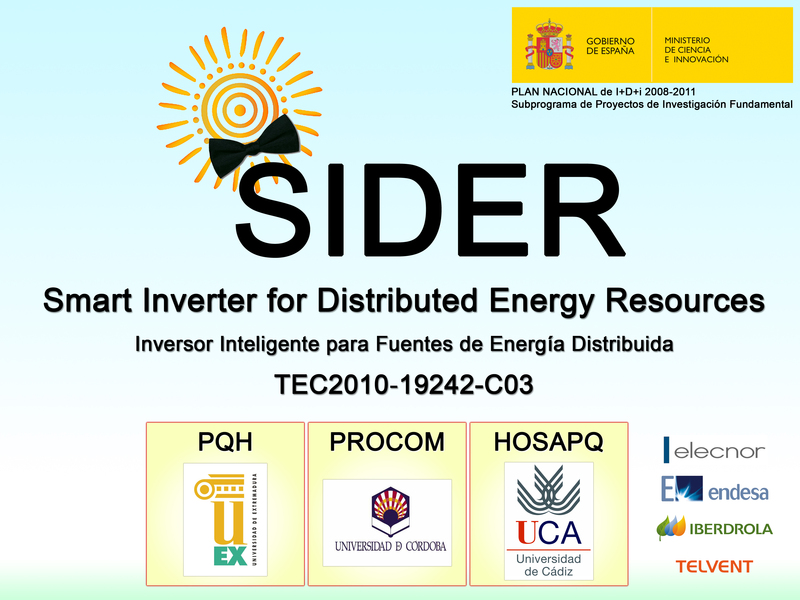 SIDER: Smart Inverter for Distributed Energy Resources. Financed by: Ministerio de Ciencia e Innovación inside the Subprograma de Proyectos de Investigación Fundamental no Orientada. Summary: In this project active functions for inverters which are involved in distributed energy sources to inject energy into the electrical grid are analyzed, developed and evaluated. By means of these active functions, inverters will take part as active devices in the electrical grid which is knowed as Smart Grid currently as evolution of classical power electrical systems. This project studies how one smart inverter for distributed energy resources (SIDER) could contribute to the Smart Grids. The project is managed in three parts in which University of Extremadura, University of Córdoba and University of Cádiz are involved. The first part analyze the power electronic controls and power quality. The second part study the communication system capabilities and the third one work in the signal analysis and process to detect and define electrical perturbations. Minicorner development with motor wheel in Electrical Vehicle WHENEVER. Financed by: Ministerio de Ciencia e Innovación inside the Programa Nacional de Investigación Científica y Tecnológica (2008-2011) Subprograma INNPACTO. Summary: The main goal of this project is to develop a corner based on a 25 kW wheel motor per wheel for class B electrical vehicle. This architecture is investigating and a functional prototype is carrying out in order to allow to the companies the development and putting on the market the electrical corner in short-term. The project is carried out by different companies and research center with high experience in the different toppics that are involved. The high level specifications,the electrical operation and the suspension and steering systems are carried out by CIE Mecauto. The cooling system is developed by Grupo Componentes Vilanova and the development of motor drive control algorithms and vehicle behaviour simulations are responsability of Robotiker Tecnalia. PE&ES research group is in response of the power electronic converter simulations involved in the electrical vehicle. City-Elec: Systems for electrified mobility in the urban environment. (PSS-370000-2009-004). Involvement: Carrying out researching group in part of the subproject SP6: Drive system / Electric propulsion in vehicle. Financed by: Ministerio de Ciencia e Innovación inside the Subprograma de apoyo a proyectos singulares estratégicos. Summary: The main goals of this subproject are researching and developing electrical drive systems with high level of efficiency, integrated and low cost based on different topologies of permanent-magnet synchronous machine or brushless DC in two ways (stand alone or on wheel). It control systems based on DC/AC converter are also investigated with a high level of efficiency and high level of use capacity during regenerative breaked. The efficient and compact gear systems are studied (stand alone or on wheel systems) and their mechanisms to integrate the system on wheel with the required control systems. Everything trying to assure a safety working and adding value face to the current solutions. Involvement: Carrying out researching group in part of the subproject SP5: Storage, adaptation and distribution of the electric energy in vehicle. Summary: The main goals of this subproject are providing suitable energy storage devices in the new concept of the electrical vehicle architecture according to the power density and the energy density. Different electrochemical technologies are tested both traditional and current ones which are more and more popular in the latest years. At the same time, different activities to research and develop new packaged systems of electrochemical batteries and new electrical and thermal manage systems are carried out. Battery chargers which energy recovery capabilities by the electric car are also investigated in order to improve the car autonomy. In this project is also developed new more efficient systems to adapt and distribute the energy to the electrical motor and to other peripheral devices wich demand electrical energy. Feasibility Study of the Superconductivity Technology Application in Distributed Generation. Global Energy Efficiency and Energy Balance in Generation, Distribution and Energy Requirements for Cryogenics. Financed by: INSTALACIONES INABENSA, S.A. inside the Subcontratación dentro del Proyecto Enedis del Subprograma Nacional para la eficiencia energética, energías renovables, tecnologías de combustión limpia o tecnologías emergentes. Photovoltaic power injection system study in the city of Badajoz. Financed by: ENDESA Distribución Eléctrica S.L..
Summary: In this project several measurements in different photovoltaic plants of the city of Badajoz have ben carried out with the aim of evaluating the quality of the power injection system according to THD, reactive and active power, efficiency, etc..
Current conditioner for low voltage distribution networks. Financed by: Consejería de Economía, Comercio e Innovación (Junta de Extremadura) inside the III Plan Regional de Investigación, Desarrollo Tecnológico e Innovación de Extremadura. Summary: The main goals of this project are designing and manufacturing of a comercial 100 kVA three-phase current conditioner connected to the low voltage electrical grid. It converter could be used by users or electrical companies in different places of the distribution electrical grid in order to improve the voltage quality at the point of common coupling and the power factor. Analysis, decision and detection of faults in electrical lines caused by the nesting behaviour of the white storks. Study of protection systems. Continuation. Summary: High impedance faults are studied in this project caused by white stork nests in low and medium voltage level electrical grid. This work try to detect and locate such kind of faults through the wave characterization based on different parameters. Having done that, the protection systems of electrical grid is studied to avoid non-desired swiching off of breakers due this kind of faults which cause stop of power supply to the users, sending out alarms to proceed with the faults clearing. Analysis, decision and detection of faults in electrical lines caused by the nesting behaviour of the white storks. Study of protection systems. Financed by: Consejería de Educación, Ciencia y Tecnología de la Junta de Extremadura inside the III Plan Regional de Investigación, Desarrollo Tecnológico e Innovación de Extremadura. Power Conditioners for Grid-connection of Photovoltaic Generation Systems with Power Quality Monitoring. Financed by: Ministerio de Educación y Ciencia inside the Plan Nacional de I+D 2004-2007. Summary: The photovoltaic (PV) generation systems are nowadays an alternative-viable energy source, being one base of the distributed generation development. However, it has as drawback that the inverters used in the interconnection system does not operate correctly, injecting harmonics currents in the point of common coupling (PCC) that could be dangerous for others consumers connected at the same point. This could cause harming, isolate defects and operation faults in the measurement, control and protection systems. In this way, it is interesting to design and develop a power conditioner with a double function:- On the one hand, it will be used as interface with the grid to inject the active power supplied by the photovoltaic arrays. This power will be fed as fundamental and positive sequence active power. That means the current injected into the grid will be in phase with the fundamental positive sequence voltage at the PCC. A sophisticated synchronisation system with distortion, unbalance and frequency variation voltage immunity will be necessary. The active power will be transmitted guaranteeing the Maximum-Power-Point-Tracking (MPPT) in order to maximise the energy extracted from the PV cells.- On the other hand, the power conditioner will reduce the harmonics current demanded by the load connected at the PCC, correct displacement power factor correction, and compensate unbalance. Control systems for active power line conditioners. Financed by: Vicerrectorado de Investigación, Desarrollo e Innovación. Universidad de Extremadura inside the II Plan de Iniciación, Desarrollo e Innovación (Acción I: Iniciación)..
Power meter according to the Standard IEEE 1459 for power systems with harmonic distortion and unbalance. Financed by: Vicerrectorado de Investigación, Desarrollo e Innovación. Universidad de Extremadura inside the I Plan de Iniciación, Desarrollo e Innovación (Acción VII). Summary: Power definitions, beneficiations and penalties for billing electrical energy charges and the measurements offered by the actual energy meters are only acceptable in case of ideal mains. However, the increase of non-linear loads connected to the utility has caused the appearance of disturbances which get the source voltage to be far away from the ideal conditions. This project proposes the performance of a power quality meter able to operate suitably in non-ideal electrical power systems with harmonic distortion and/or unbalance. The most relevant in the new meter is that it will operate according to the Standard IEEE 1459, which is now in trial-use state, but it is hoped to become the reference for the measurement and invoicing of the electrical energy in the future. The equipment will allow separating the terms proposed in the new definitions for power in non-sinusoidal regimen and calculating the new pollution ratios and merit figures, showing the results in real time. Present criteria for beneficiating or penalizing the electrical consumption will be analyzed and new criteria will set out to consider the reactive energy demand (not only inductive type, but also capacitive one), imbalance and distortion in the demanded current. Power conditioner with hybrid topologies (active and passive filters) for the improvement of the electrical supply quality. Financed by: Consejería de Educación, Ciencia y Tecnología de la Junta de Extremadura inside the II Plan Regional de Investigación, Desarrollo Tecnológico e Innovación de Extremadura. Summary: The purpose of this project is to developer power conditioners equipment basis on new topologies by means of association of several current active filters in combination with passive filters, in which each of them are entrusted on the reduction or elimination of perturbations in a determinate range of frequencies. The study must conduce to the optimization of the components, decreasing weight, volume and losses. Several control strategies that improve the general characteristics of the equipment will be developed, applying for that the most recent process systems. This will allow giving to the equipment the necessary flexibility to adapt their working characteristics depending on a rule about perturbations that is expecting to change, because of it has to include a redefinition of the power and energy terms to invoice by the supply companies. In this sense it will be necessary to study in depth the measure procedures. The equipment will be placed in the output of the distribution transformers or in the connection of the receiving installation, to avoid the perturbations caused by the users to affect the distribution system. As well as improving the supply quality in the receiving installation, This equipment will be able to supply a fraction of the load, which is called as critical load, during one second (because of the most of the supply interruptions in the distribution network are less than this time length). Power electronic converters for the reduction or elimination of the perturbations in the electrical supply network. Reliability scenarios modeling as planning tool for the electricity companies. Involvement: Collaboration in the project execution. Description study and improvement analysis of the Deutz Diter hydraulic pumps. Involvement: Execution of the hydraulic pumps testbench automation. Financed by: Deutz Diter, S.A. (empresa privada). COVENE (Control of a VEhicle in a Natural Environment). Involvement: Collaboration in the project execution with the industrial computing department of the IAI (CSIC). Financed by: Consejería de Investigación de la Comunidad de Madrid. Development system of power electronic converters for the computing equipment supply. Financed by: Comisión Interministerial de Ciencia y Tecnología (CICYT). Ayuda infraestructura de investigación. Development equipment of power electronic converters. Financed by: Programa Operativo FEDER II. Acción servicios de apoyo I+D. Conditioner for critical loads and other electric nodes (ACCIONE). Involvement: Collaboration in the project execution with the Electrical, Electronic and Control department of the UNED (Madrid).